Liberty Specialty Steels have updated their apprentice training centre lighting using IMO’s iSmart lighting energy control. The new system provides improved levels of lighting control and saves energy. The high-bay lights used in the 25-year-old centre were on all the time, even though the training centre operated from 8am to 6pm. Control of the lights was by several archaic blade-type isolators. Firstly, they selected the IMO iSmart intelligent relay to control the sequential start-up and shut-down of the high bay luminaires. This is because the installer found an efficient way to control the lighting, using a wireless programmable solar cell, wireless switching and PIR’s. Furthermore, a lux sensor monitored ambient light from the skylights, consequently ensuring the lights only turned on when needed. 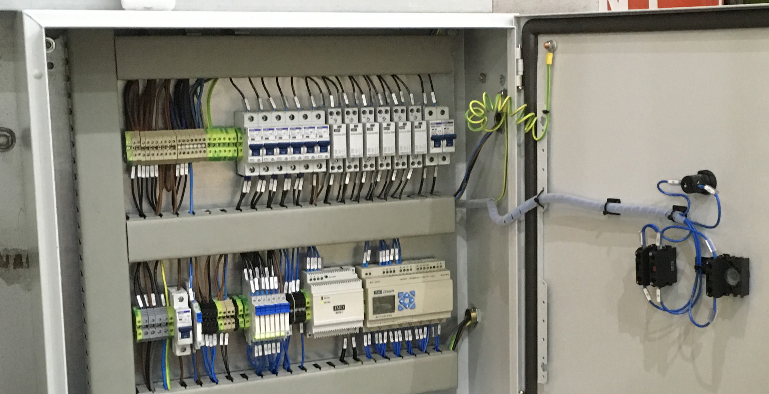 TH Electrical provided the control panel using an array of IMO panel products. These included the iSmart, AC isolator, miniature circuit breakers, modular contactors (for heating & lighting), power supply, power relays, pilot light and push buttons. In summary, following a one-day installation, they were able to operate the lights from the panel, with all the additional technology only requiring one-day to complete. When compared to the previous year, the estimated energy saving payback period is under twelve months. Versatile and highly cost-effective, iSmart is ideal for small machine applications including automatic doors, packaging machines, vending machines and much more. Offering the capability of a small PLC, new iSmart V3 is a flexible, easy to use range of intelligent relays. Programming iSmart intelligent relays is by PC using the free software. Alternatively, programming is by using the integral keypad, using Relay Ladder or Function Block. To cope with ever growing demands on the iSmart, the memory has been more than doubled in the most areas. The iSmart now contains a full 32k of Flash memory, compared with 4k in the iSmart V2 ranges. – Maths – The iSmart can now perform simple Maths calculations. – Analogue Ramp – Ramp Analogue outputs, Data registers or PWM outputs. – PID – Control a complex process with PID control. – Multiplex – Switch data values or set-points easily with a multiplexer block.